Oversized Blanket - 80" x 90"
For dorm bedding that is made with superior natural fibers, designed for luxurious comfort, and created with a fashion-forward style, you cannot beat our oversized Pure Australian Woolen Chunky Knit Blanket in natural color for your dorm bedding. 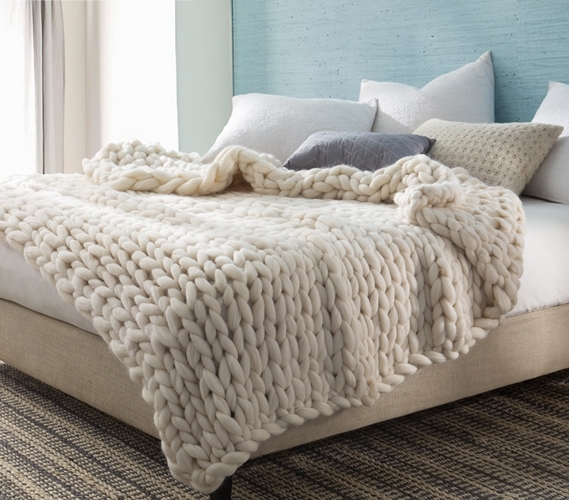 Totally on trend, our chunky knit oversized Australian Wool blanket delivers serious style and cozy soft comfort. Widely regarded as some of the best wool in the world, Australian Wool keeps you incredibly comfortable while being breathable and lightweight dorm bedding. The oversized dimensions (80” by 90”!) means your super soft oversized chunky knit dorm bedding will fit your Twin XL bed freshman year all the way to your off-campus apartment college bedding senior year, and well after. Although perfect for using all year, our super soft Australian Wool dorm bedding really shines during winter months. Like your favorite knit sweater, our chunky knit blanket will keep you warm while also being totally breathable. And, aside from being the most comfortable college bedding you’ve ever owned, our Pure Australian Woolen Blanket is by far the most stylish. Our oversized college bedding blanket is your dorm room centerpiece for maximum impact with minimum effort. Show off your sophisticated taste while still having extreme comfort with our high quality and durable Pure Australian Woolen Blanket in gorgeous natural color.